Emily Stevens has been in a violent relationship for years but now it has gone too far. Escaping from her husbands abusive ways, Emily runs away with their daughter Eden. On the drive to Emily's fathers house they are attacked by a pack of werewolves and seek refuge in a nearby home. Only their troubles have only just got bigger, as they come across a psychotic killer who ties them up and abuses them along with another group of women he has captured. Now all who are trapped with this deranged killer must come together to fight not only this psycho but the threat clawing its way at the doors. Todd Sheets has been making movies since the mid 80's and with every movie he gets better and better. 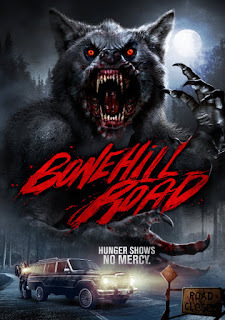 His love for werewolf movies comes across in BONEHILL ROAD especially in the use of practical effects and the refusal to use CGI for the big hairy monsters. There is a great looking prcatical werewolf transformation scene involving Dilynn Dawn Harvey that has to be seen. Linnea Quigley has a bit part in this movie as one of the victims but its always nice to see a 80's scream queen in new movies. For such a small budget movie it has big ideas but pulls them off and makes werewolves terrifying again. Overall if you wanted a new werewolf movie too watch this is the one horror fans have been waiting for.